Since the powercut it will not boot, I get a notification: RAiD0 (Stripe), strip 128kb,Size 596.2 GB, status Failed,bootable No. Anyone any ideas what this means. The Os is windows10 and clean installed after a replacement PSU was fitted. As a by the by I have run all of the internal system tests and all seems Ok, unless of course I missed something. The Dell XPS 420 shipped with Vista and not Windows 10 which means a clean install must have been done, if you did not set up a RAID array on installing Windows 10 you should not get such a message, did you set up RAID when installing Windows 10. No is the easy answer, I'm a nontechnical, the most iv ever done is replace the PSU, when I say a clean install what I actually mean is that the HD on the system is only used for software all info is kept on a number of external drives or my NAS. So since purchase the OS has gradually been upgraded form vista, through Xp, to w7, W8, and recently to W10. At the same time as replacing the PSU I checked for a bios update and reflashed to A07, and then an install of office2016. Since then all has been great, the system is used mainly for report writing and photographs. 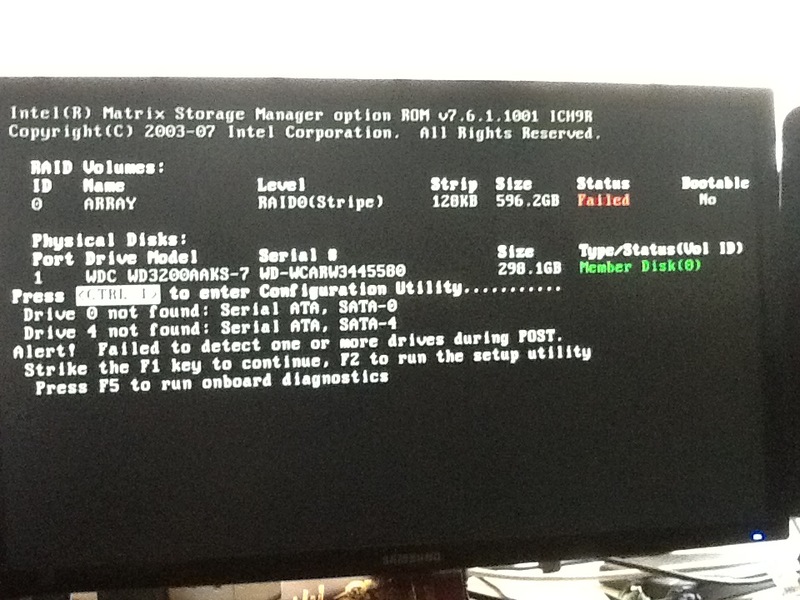 I had wondered if the HDs, had gone down but don't know how to check, or if it's worth trying th dell boot disk, as the system does not seem able to find any drives to boot from, but when I run the diagnostic everything is coming back as passed. when I say a clean install what I actually mean is that the HD on the system is only used for software all info is kept on a number of external drives or my NAS. Crossed wires as a clean install implies that certain software has been uninstalled and reinstalled afresh, in this instance it appeared that you had done a clean install of Windows 10 and that was why I asked about the RAID drivers, by the by now you have explained. Very surprised that the computer worked with Windows 10 at all tbh being that there are no Windows 7 drivers let alone drivers for Windows 10. How long was the computer running fine for and did the computer shut down and reboot without issue on more than one occasion after flashing the BIOS. 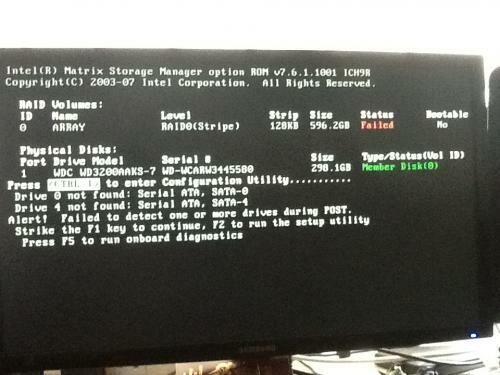 Is the HDD detected in the BIOS, a Seagate HDD will begin with the letters ST and a Western Digital HDD will begin with WD, other brands vary and please note that any mention of a HDD in the Boot sequence that is not labelled with such letters is only the boot order and not the BIOS detecting the presence of a working HDD. Not heard back from you jb852, do you still require assistance or is the issue now resolved, an update would be appreciated. As far as the run time since installation about a month, and rebooted every time I used the item, as I shutdown the system when finished with it, so at least every other day, sometimes twice a day. Haven't been able to check the HD info yet as still a little under the weather, and not willing to risk messing something up. Promise I will get back to you until we get a resolution, it just may not be very rapidly at the moment. If you wish to continue now, please advise the state of play with the computer now and anything that you may have tried along the way. As far as trying anything, only reboots, I have considered unplugging everything and then repluging followed by a further reboot. Edited by Jb852, 11 December 2017 - 04:41 AM. Is it possible that you have two HDDs, one a 1TB partitioned into two and the second a WD drive detailed below. Is there any data on the boot drive that you would like to try and secure. In case you are not aware, the HDD passed the diagnostics test because it was tested for functionality and not that the OS was bootable. Can the raid be changed back? If it can be put back will it cure the problem? I will check the drives it's easy enough to look at them with the cover off. If one of them is a 1TB why add another which is 320GB? Hi again sorry I didn't answer your question properly. The hard drives only have software on them, no information at all. I have a NAS and a number of external drives I keep all of my documents on. When I am able to work I work from home and I can't afford to have anything on the PC that isn't secured. So it's the OS currently W10, Office 2016, and photographic software, so nothing really to loose. Reinstall Windows 10 I`m afraid, on brand name computers that have been upgraded from one or more OSs this does tend to be inevitable at some point with OEMs such as Dell and HP etc. When you install Windows, install it to its own partition, make the partition at least 256GB, this will allow for the present OS and the many future updates.